Machinga, Malawi: A bowl of porridge. It can seem so simple. But for a hungry child and his parents, it is reason to celebrate. Every weekday, in 12 countries around the globe, Magnus MacFarlane-Barrow gives this life-changing gift to schoolchildren. His program, Mary’s Meals, has provided them with free, nutritious meals since 2002. MacFarlane-Barrow and his group now have their own reason to celebrate. Last month, his program hit a major milestone: Mary’s Meals feeds more than 1 million children every school day. That’s 5 million meals every week. “It’s a mind-boggling number,” said MacFarlane-Barrow, who still runs the program from a tin shed on his father’s Scottish farm. 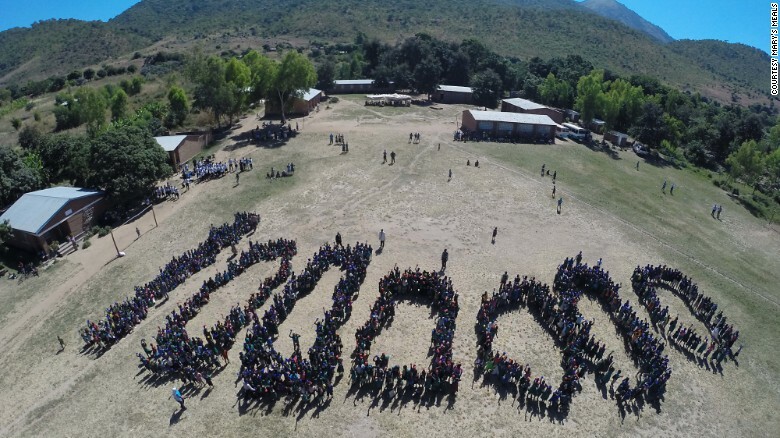 He and the group recently celebrated the achievement in Malawi, where the program began. The former salmon farmer was recognized in 2010 as a Top 10 CNN Hero. At the time, his program was feeding 400,000 children a day. CNN: One million children, every school day. How does that feel? Magnus MacFarlane-Barrow: It’s something we never could have imagined. We celebrated in a small village in Malawi in the middle of nowhere, quite a remote, beautiful village. And the whole village was part of the celebrations. The chiefs, the head teachers, and the children, of course, were the center of the celebration. We were singing and dancing. It was just a very, very special day. The joy of those kids is just something incredible to experience. Mary’s Meals recently celebrated a milestone: feeding more than 1 million children every school day. CNN: The meal that children receive is often as simple as a cup of porridge. How much impact does that have? MacFarlane-Barrow: One cup of porridge does a lot of different things. It brings many children into school, who never went to school before. In addition, many children who were going to school hungry, they start to learn. Their health improves. And then we see amazing results with academic performance. So it’s a very simple thing, but the implications are huge and go beyond this generation. Those children growing up now with an education, their children are going to benefit as well. CNN: What sparked your idea to start Mary’s Meals more than a decade ago? Magnus MacFarlane-Barrow: In 2002, I was in Malawi during a year of terrible famine, and I met this family — the father had died, and the mother was dying, surrounded by her six children. I began talking to her oldest child, Edward, who was about 14, and asked him, “What are your hopes?” And he said, “I’d like to have enough food to eat, and I’d like to go to school one day.” And that was it. That was the extent of Edward’s ambition. That was something that I encountered a lot — children who were missing school because they were working or begging. That encounter really ignited this mission of Mary’s Meals, which is simply about providing one good meal every day in a place of education. And Malawi remains, by far, our biggest project. We’re feeding over 25% of the children of primary school age in that country today. CNN: You and your organization have had quite a journey, which you wrote about in your recent book (“The Shed That Fed a Million Children”). What do you hope others take away from your story? MacFarlane-Barrow: I just feel this great sense of privilege that I’m part of this mission, this movement that keeps growing around the world. The million is this amazing landmark, but it really isn’t “mission accomplished.” Our work’s just beginning. We’ve proven that this works, and now we’re just thinking about the next child. I hope people take away that this is possible. If we are feeding 1 million children, why are there another 57 million children hungry and out of school? So that’s why we’ve celebrated it as the first million, because sadly, it’s not job done. There are many more children waiting. Want to get involved? Check out the Mary’s Meals website and see how to help.